Morning of anticipation, a special dive to come. What's it gonna be? 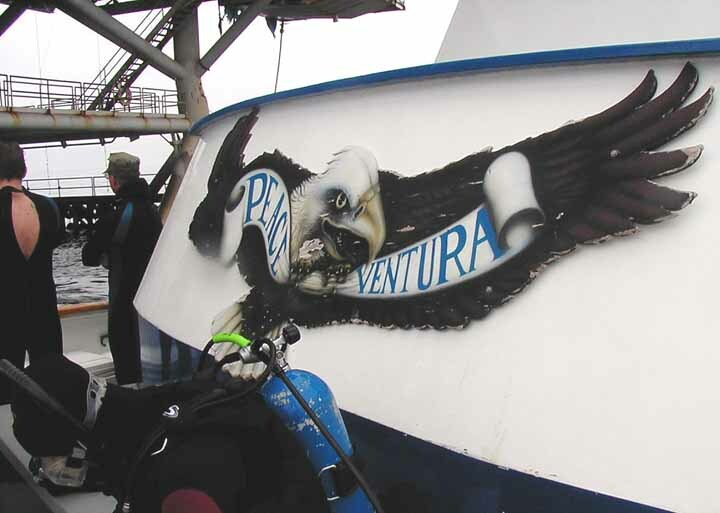 Going on the Peace to dive the oil rigs is one of the ultimate dives you can make. The unmatched beauty of the open ocean filter life combined with an exotic dive that you had better be a journeyman diver to make. As far as a diver is concerned, there is no bottom. Everyone was aboard. Some I knew. Eric Bowman was skipper. The camera rack was full and it was a very full boat, but with a 7:00 am departure, this amounted to an easy trip for a lot of this group. The dive rats had certainly crawled out of the cracks for this trip. Yes! We turned the corner of the breakwater past the park boats and the ocean was flat under a grey sky. That was the first test that had to be passed. I still get blown away at the actual size of the Ventura Harbor breakwall. Especially at low tide you see that it is over 30 feet tall. It is made not of rocks, but interlocking concrete barriers. I've seen days when the waves tested that strength and height. This is going to be a very short trip. Little more than an hour. It's time to eat and assemble gear. God is it crisp and invigorating! Just walking across the deck wakes you up to that this is a different world. We came upon a school of dolphins swimming and jumping, but they were on their own path and didn't stop. In a short time an oil rig came into sight. This was Platform Gloria. They all have women's names. Gloria is pretty much the half way point to Anacapa Island. We went towards it for miles and then passed it, but we could already see the next platform about two miles on. This was Platform Grace and these were the only two rigs in sight this day, though there are some more platforms miles to the north. Grace is big and an engineering marvel, but I'm not sure about her grace or beauty. 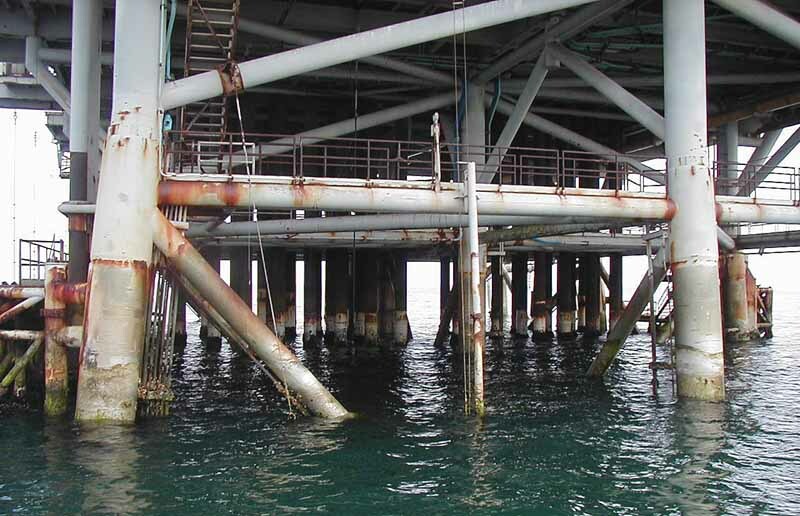 The structure underneath is like the structure above water. For some more pics of the rig itself. When Eric stopped, we were near Grace. Depth was supposed to be around 340 feet. There would be no anchoring today. Eric called us all into the galley for the longest pre-dive briefing I have ever been to. He tried to emphasize that this is a dive where we had to keep our wits about us and follow procedures. Watch your buoyancy. Cameras can be put in the inflatable and delivered to the divers in the water. 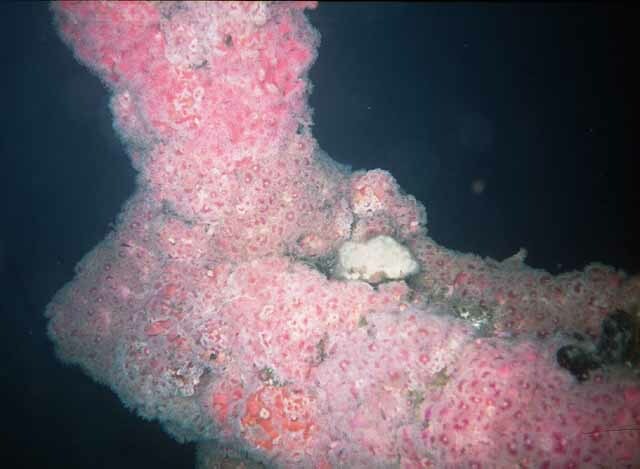 Surface under the rig on the side nearest the Peace. Stay away from the supply boat that was docked. Group together on the surface. Then follow the directions of the crew signaling divers to stay away or to come aboard the boat. Entry would be through the front gate. We would dive two groups that would alternate. Group one was supposed to be a bit more experienced. "Watch your buoyancy. Group one to the bow". It was calm enough in the water, though it was a bit green. The swell only made the water rise about 4 feet up the pilings. They are mostly clean above the water level. I as at the end of group one entering and I gotta admit, I was a bit baffled why people were on the surface. I didn't care much and jumped in carrying my camera, as soon as it was clear below. It was 30 feet to the first column. I went past that and down. It was dark. Vis was limited, but it was still morning and shadowed under the rig. I stayed very close to the leg I was following down. It would have been easy to lose sight of the rig in the dimness. Passing the thermocline was an eye opener. As soon as I passed 40 feet, I turned up right and drifted straight down to the cross pieces of the rig at 80 feet. It is a real nice place to have a visual to track on the way down. It helps avoid deep mistakes. I got composed some next to a large leg pipe and looked around with my light. It was the incredible sights and colors that had brought me here. This is what one of the large legs looks like. Colors all crammed together. Say a 4 foot diameter pipe. It was so dim that I decided to focus on taking some pictures in one area. I parked off one large leg at about 60 feet or so and moved up and down and around. There was strong local surge around the members of the rig. The current was mild and easy to deal with, but get near one of the legs and you get sucked around. 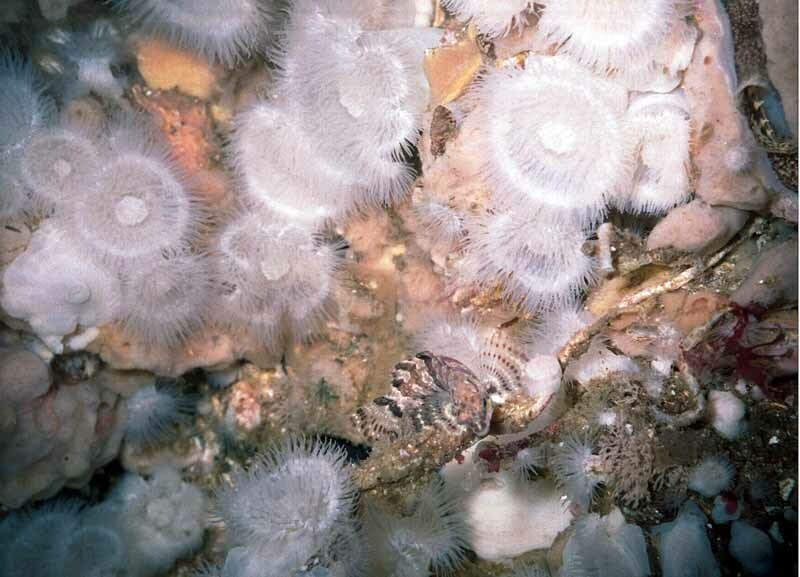 The metridium anemones are as delicate looking as they are pure white. This was the dive. There is more tiny life on one of those legs than you are ever going to see on one tank of air. 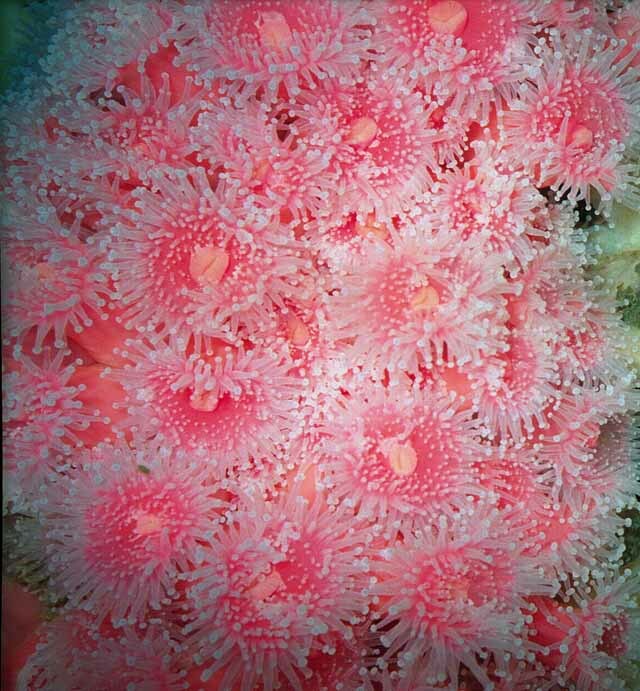 Look far away at the areas of pure white Metridium anemones or the incredible array of brilliant hued Corynactis anemones. Look close at all the other life hiding amongst them. 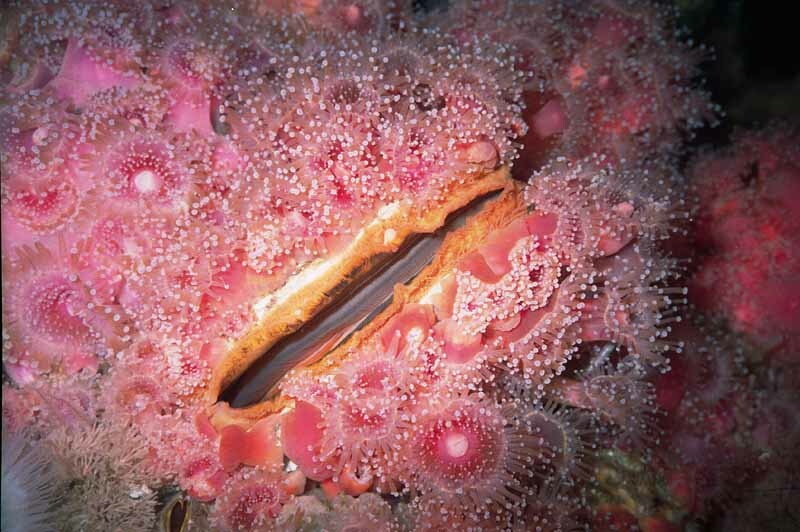 I love the variety of colors of the Corynactis anemones, but especially look for shades of purple and lavender. Here I could pick any shade I wanted to look at. Colors like your eyes were made for. The rig is not solid. It's put together partly with solid joints, but also a lot of the parts come together at collars that move over the legs. At first I didn't see too many scallops. Most were small, which surprised me. I don't know how many divers take scallops here. There were many small fish, but no larger ones to be seen. I just clicked and clicked. Every so often I saw a scallop worth grabbing to feel the size. If they were big enough, I popped them off into my bag. There were cancer crabs in a lot of places, but none were really big. Occasionally I saw other divers in the dimness or should I say I saw their lights making small holes in the dimness. Some came near, but most were busy with their photography or exploration. I spent most of my time between 80 and 40 feet on a group of legs and members that all came together at about 60 feet. Moving up the legs in the surge, you are trying not to bump them, but the other legs are close and you find yourself bumping into things, especially as you move up and various members come together. This is what a cross memeber looks like. Real estate is at a premium. It was time to go up. I knew I was well within the rig, but moved towards the side near the Peace. The life shallower on the platform is very different. There are huge mussels growing thickly. Some of the mussels are easily a foot long. They are well worth taking a close look at. 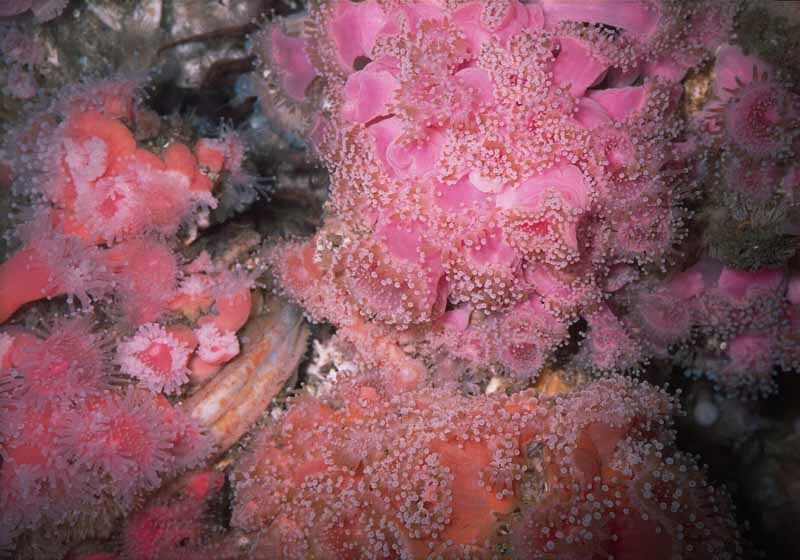 Between them grows a variety of anemones, tunicates, scallops, crabs and millions of brittle stars. Everything is delicately beautiful. When I came up, there was a group waiting together to board, but Bob was waving them off. I swam towards them quickly, but before I got to them, Bob had waved them in. He signaled me to keep coming. The rule of exiting was hold onto the dive platform, but stay out from under the other divers exiting up the ladder. They might fall on you or a tank could fall. Back on the Peace, I was surprised to see a few divers come up a bit away from the platform and one actually came swimming around the oil rig supply boat, which was starting up. That didn't look good. Sure enough, after everyone was aboard, Eric called us into the galley and chewed out everyone liberally. "You were supposed to be the more experienced divers. We can go to Anacapa and dive the Gold Fish Bowl for the rest of the day. Propellers and divers mean death!" Uggh. This went on for a while. Frankly, it surprised me how careless some of the divers had been. Nicely, he didn't move the boat and we prepared for the next dive. I had gotten a look at some of the incredible camera gear some of the laddies were armed with. There was one digital video camera, but what intrigued me was this one digital rig with a camera in it that was bigger than most underwater cases I saw. From what I understood, the large pair of strobes was just barely enough to illuminate close ups because the guy was taking pictures at ASA 35 to 40. It would have an amazing depth of field. I'd like to see those pics. One guy mentioned that he had seen a Giant Black Seabass... at about 160 feet. Barnacles make their living where they can. It was time to enter again and see what pics I could get. Bob was trying to keep me organized so that I would go in with all my gear. It looked lighter as I went down, but the vis wasn't much better. Again on this dive, I really didn't travel that much and just looked for pictures on a set of legs and members. It was amazing how much little stuff there was. There were colors that have no name. I was just traveling up and down about four or five columns and across some of the members between them. It's really easy to swim up into where pipes come together. I went as high as I could to look in the most hidden and protected crannies. Every hole you look into has something amazing in it. Every so often, I would take off the macro lens when I thought I could get a shot at a meter or more. This time I also saw a few different kinds of salps and jellies drifting by. Some fish were working on the salps pretty hard. 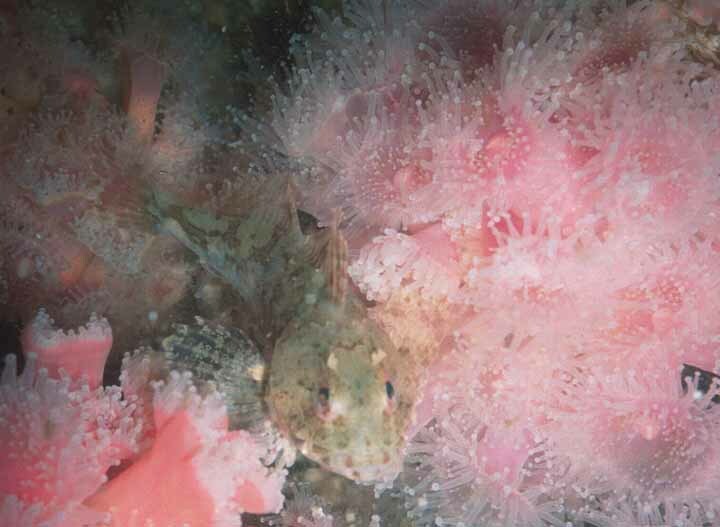 There were lots of small fish, like this sculpin. This time, most of the divers surfaced where they belonged. There were sea lions cruising the area though they didn't seem to want to play with the divers. They spent their time on a docking area. Eric said that the surface interval would be longer and it was time for lunch. I cleaned up some scallops, chopped them some and then put them in soy. They were great. Some people helped eat them, but only a few. Big orange scallops are like a neon light even in the other colors. It was starting to sun up some by now and it was time for the final dive. The final dive of some great diving opportunity. I wasn't going to cruise this dive. I was going to travel. I wasn't going to have bottom time limitations and I wanted to travel the rig some. It makes for a surrealistic dive like you are swimming through some complicated giant jungle gym. You can make a free fall through small openings between the braces. As I was gearing up I made a comment to myself that I wished I had brought my big light. The nice thing about divers is that someone over heard me and offered me his HID Light Cannon. I had never used an HID light and it sounded like a great offer. I entered with light, camera, iron, pony and assorted other crud. I felt like a Christmas tree, but as soon as I was in the water, it was my element. It was far lighter now and vis was much better, perhaps 30 feet or so. I wanted to head down to the major cross members at about 75 feet so that I could cruise around the entire structure. That is really like flying. Scallops of every size are all through the anemones. The HID light was an eye opener. I've used bright lights before, but the color correction of the HID was as good as they say. 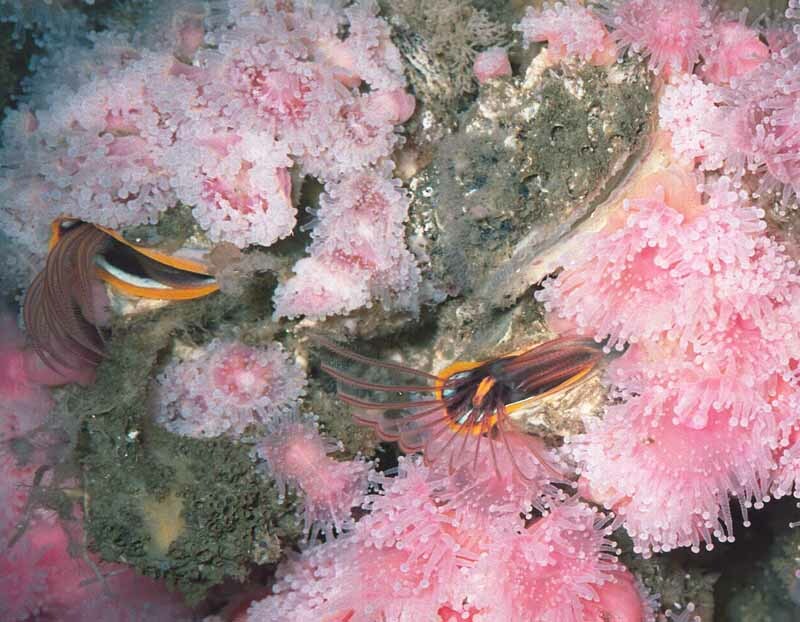 It changed the nature of the dive and showed far more color and beauty than I usually get to see. Practical vis was near 40 feet by now. I crossed down diagonals then crossed horizontal members to the other side. I was just traveling, enjoying the sensation of flying. Then for all the gear I had, I realized I had forgotten my goody bag and I still wanted to get a couple scallops to fill my limit. I found this sort of a bowl with no bottom that was 6 feet across. It was absolutely solid with Corynactis of every color. I saw my only nudibranch of the dive. A small Lemon one. There were a number of fish in the area too that were bigger than what I had seen. Some were perch and there were some fair sized bass as well. From all the fish I saw hiding in deep in various holes, I am sure that it would be a very different dive at night. Air was getting low so I moved towards the side where the Peace should be. I found a couple of nice scallops and cleaned them off before leaving them on a convenient cross member to pick up when I went up. I wanted to make the dive last as long as I could, but considering where I was, I didn't want to push it either. 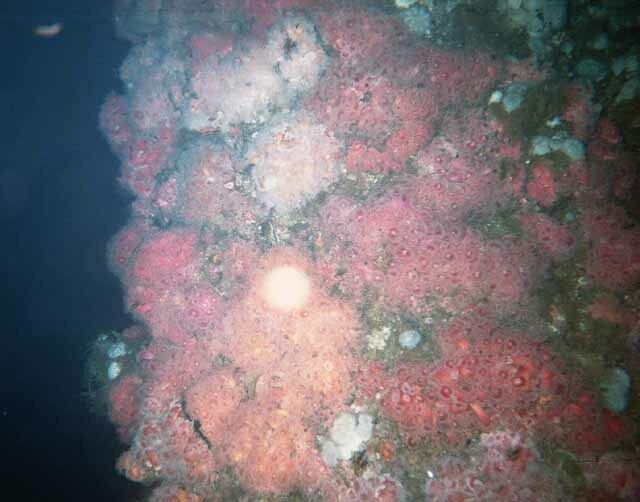 I slowly progressed up above the thermocline to where the mussels, aggregating anemones and brittle stars were. I mostly hung on to mussels and just looked at all the life. Unfortunately, I reached the surface and made my way back to the boat. A great dive boat with great people! Gear was put away. Some diving was done in the hot tub. Some amazing stories were told. It was a short trip back to the docks, one of the things I like about a trip to the rigs. Still, I love to be on the ocean. I love to feel the salt air in my hair as I stand on the bow and watch the sun going down over the sea mists. I love diving. I did get more pictures that I thought were good, but they didn't really fit on this page. So here are a couple of pages with a few more pictures. For some more pics of the rig itself.